The most popular Cardiozone treadmill! 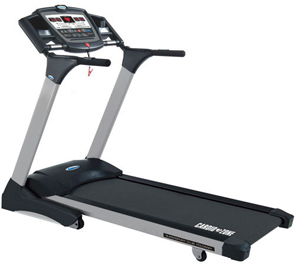 CardioZone™ has done it again, leading the treadmill industry with spectacular Health Club quality and value that outperforms treadmills selling for up to $7,000. Powerful 4 hp "WhisperQuiet™ motor, Unbeatable 500 lb. weight capacity, BioReflex™ deck and SoftStep™ technology provide maximum shock absorption for the back, knees & joints for a soft, safe, smooth ride. Programs- 5 preset / 2 custom / Basketball, Golf, Tennis Trainer / 1 Body Fat % Analyzer/ 4 user defined / 1 Manual / 1 heart rate interactive. Free Upgraded Lifetime warranty (residential and commercial use) on the drive motor, the frame and all welds, and the running deck, these are all of the most expensive components. $500 value. 2 Years on all other Parts and 1 Year In-Home Labor/Service warranty for non-commercial use. ToughTrain 3.5 out of 5 Possesses above than average featues and available in a discounted price. Can be a best deal at this price. *Note: Most of the sites, stores or shopping portals listed above sell CardioZone Commercial SuperSport HR Club II Fold-Away with discounts and other exciting offers. There is a possibility that the some of above websites are not selling CardioZone Commercial SuperSport HR Club II Fold-Away now. Toughtrain.com is not liable for such cases or instances. Also we do not recommend any seller for CardioZone Commercial SuperSport HR Club II Fold-Away and a buyer should buy from where he/she gets best deal with quality of products, service and on time delivery (shipment).